So I decided to take some time and write a Numark Mixtrack Platinum review. 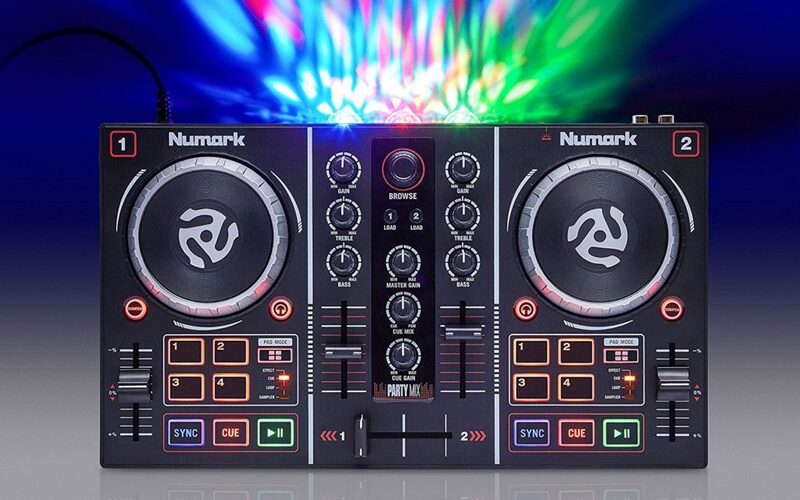 The controller is one of the latest additions to the Numark family. 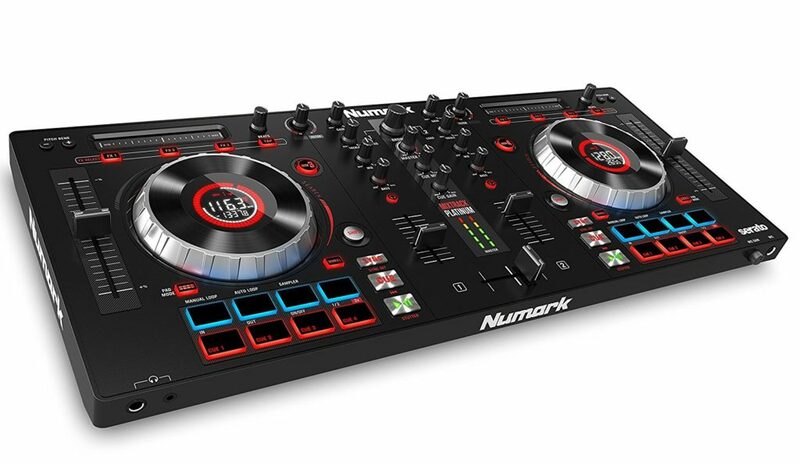 Numark intends that the controller for the skilled amateur. As such there’s a lot of features added for ease of use and monitoring for the user. While at the same time some top range features are left out. All said and done the controller is very good value for its price. Usually a feature like this is only found in higher priced controllers, but the Mixtrack Platinum comes with 4 channels split between 2 decks. Allowing you to load up to four songs/clips to play at any time. The deck select allows for mixing in samples and clips easily. Most controllers at this price only allow for 2 channels. The main selling feature of the Mixtrack Platinum is its Hi-resolution jogwheel displays. These are very nice as they’re easily seen and monitorable by the DJ. They show all kinds of useful information, like the BPM, platter position, remaining time in the song, a key lock and the pitch. However, one issue that I ran into was the display easily got a scratch from transport so you need to be careful not to throw it into a backpack with a bunch of loss objects. Another piece of information they show is a great indicator of which channel is currently running on the deck. Each deck can swap between two different channels. This display was unexpectedly very useful, and much better than the traditional indicating LED in the heat of a performance. One issue I found was there was a very limited amount of track effects. At the most there were 2 settings for each effect. Essentially making you feel limited on what you can do with the effects themselves. At least you can stack 2 effects allowing for tons combinations so it’s not like there’s not a lot to do. But it definitely feels like begginer controller. As for using the effect settings themselves, they have an intuitive dynamic touch strips where you slide your finger along, similar to a straight fader, but fancier. I didn’t have any issues with it, but I do worry it may misbehave if your fingertips are wet or cold. When it comes to the design and construction of the controller. I’m impressed, it’s pretty sturdy constructed with hard plastic. It’s durable and lightweight allowing for travel, I wouldn’t feel bad putting it in the hands of kids. Something that always impresses me and is actually one of the things I look for in a controller that this one has is the 100mm faders. Long faders allow for you to very precisely adjust your settings manually. It doesn’t seem like much but that extra physical space is really nice. This Mixtrack comes with its own soundcard, it’s a decent 24bit card that allows for great sound. Anything more would just be a placebo to human ears. The only issue is that it’s RCA out only which is unbalanced and can lead to crossover in large club setups. It has two monitor feeds, allowing for both 1/8 and 1/4 headphones. Another hardware consideration is the power. If you opt to use an external soundcard, or have a complex set up you may need to also look at getting a powered USB hub. 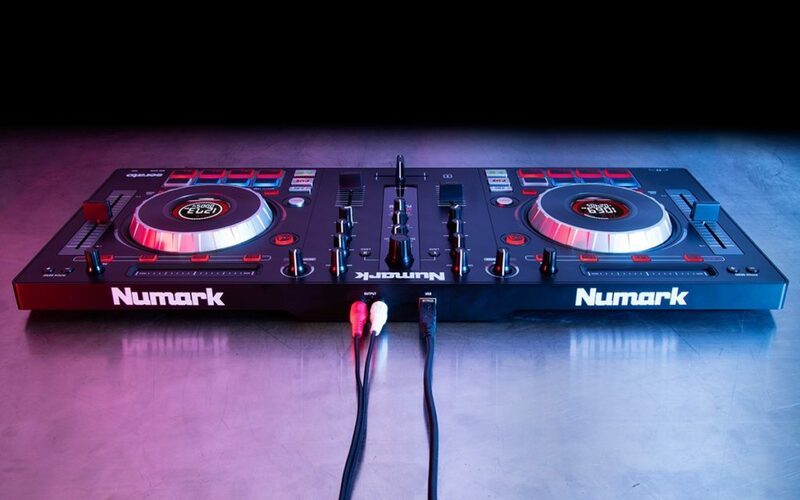 The Numark Mixtrack Platinum only comes with the option of being powered by USB. This means you need to plug it into your computer, and if you bring a laptop your USB slots may be limited (see an example in the pic below) and if you have too many devices running it may start to misbehave while running on low power. Another issue I found is it didn’t come with a power off. I have my computer in my bedroom and have to fully disconnect the controller from my computer otherwise it stays on. A slightly distracting personal issue but one all the same. 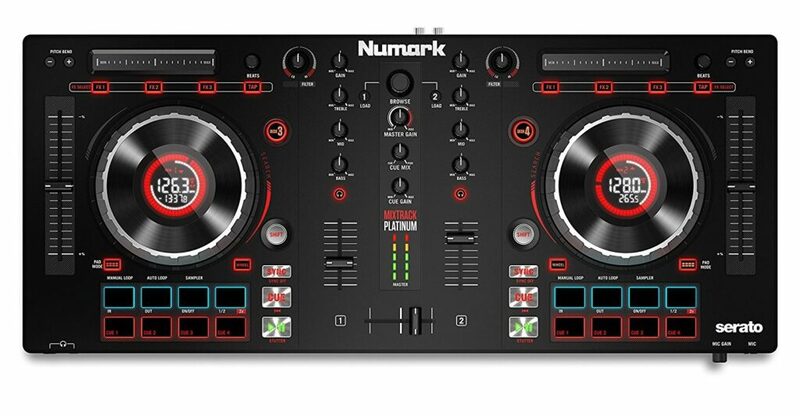 Overall after carrying out the Numark Mixtrack Platinum review I’ve seen that it’s quite good for it’s price. It does have some weaknesses moving into the professional sphere but it will carry you well as a midrange DJ controller. It has some nice standards of living, like it’s original Jogwheel displays, yet at the same time has some issues with the more creative aspects of DJing. I was surprised by how small the Party Mix is in person when I first saw it. Obviously, I knew it was going to be compact, but I was initially worried it might impact performance. However, I’m happy to report my worry was for nothing. If anything, the smaller chassis allows me to take it more places, and my kids can easily tote it from room to room while they play with it as well. The plug n’ play aspect is appreciated. Nothing’s worse than installing a bunch of extra drivers or having to buy extra gear to setup something like a beginner’s DJ controller. I like that it comes with its on software. As I later mention in this review, it’s optimized to work with the software it comes with. Luckily, you actually get the software for free—for keeps. This would have been a downside if it was merely a free trial, but thankfully you can continue to use it, which makes it worth it, in my opinion. The Party Mix easily connected with both headphones and speakers we already had at our house. The connection was pretty standard, so for those who already have their own, you likely won’t have to buy any, which is another very likable aspect. Most important is functionality. The Party Mix offers a lot of capabilities for a DJ controller that is targeted at beginners. You can actually make some quality mixes and it’s easily to tinker with them to get the sound that you want—the scratch pads are especially fun to play with, which I suppose is what most of us adults who have always imagined ourselves DJing have been dying to do since we were kids, since, you know, there were actually records back then. As I mentioned before, I have kids, and they love the Party Mix as much as I do, so, in my opinion, it’s great for all ages, which makes me love it more. To fully access the included free software, Virtual DJ LE, you have to go to the website and enter the registration code. This is a bit annoying, but at the same time, it is your free pass for the software, and the good news is once you enter it, it’s yours for life. 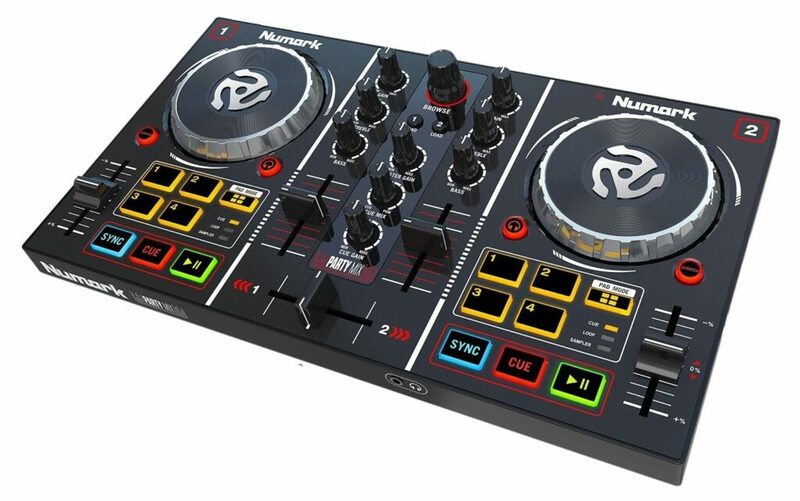 Since it’s intended for beginners, it’s really only designed to be used with the included software, but this isn’t really an issue for the DJing novice, and if you end up becoming serious about DJing, you’ll likely upgrade to a different controller anyway. Numark’s Party Mix is covered under a warranty, so if any issues arise during the warranty period, you’re good. 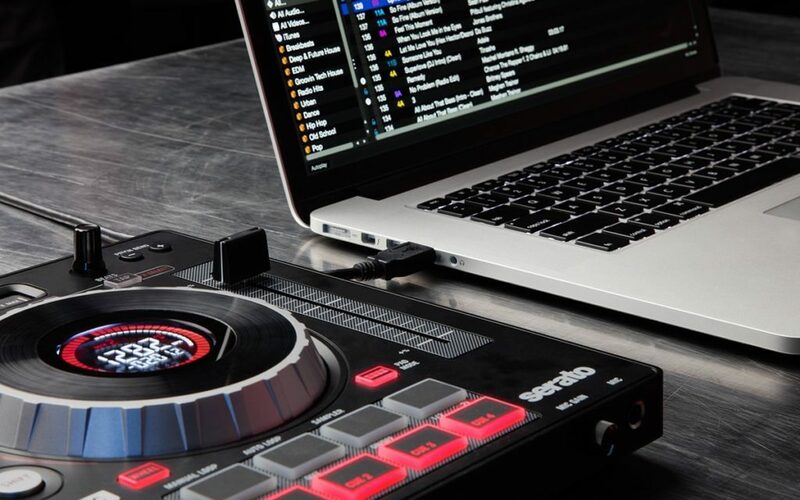 The Numark Party Mix is an ideal DJ controller for beginner DJs by providing all the basics you need to get a handle on basic DJing skills and concepts—and then take them to the next level. DJing a wedding can be a lot of fun and also a lot of hard work so it is important that things are done right. Being that weddings are a pivotal part of people’s lives making sure everything runs smoothly is of utmost importance. A good DJ can make or break any wedding, so come prepared with plenty of music. It’s important to treat the client as a customer and to craft your show so it fits with their desired experience. Be sure to find out all the information before hand. What genres to play, how old the guests are, special songs for certain dances, and logistical information such as stage size and set times. You’ll also want a suitably sized library of tracks for any situation. If you’re doing some heavy technical mixing and you’re on for 2 hours you’ll want 6 hours of music available. If you’re just playing track after track with no mixing you can shorten your library length. Here are some additional tricks and tips to make sure your wedding service runs smoothly every time. The setup is the first step in Djing a wedding. Make sure to leave plenty of time before guests arrive to setup the equipment. Often times this will take up to an hour depending on how much equipment is being used. You’ll want to get the acoustics set up while you have access to the room before the guests arrive. Be aware that often times there will be a long period to wait before a DJ’s duties come into play. Try to act professional while you wait as you’re on the job. It’s extremely important to gauge the acoustics of the room to give a great performance. Make sure to set the speakers up according to the shape of the room to get the best sound. It is very important to do a test run of the sound system before the wedding gets under way. Play a song and walk the room, notice any spots where sound misbehaves and see if adjusting it helps. One of the biggest issues is corners trap bass so heavy base tracks may disrupts tables in these areas. When guests start to arrive it is a common custom to have light music playing, this music will likely continue throughout dinner. After dinner it is time to play the bride and grooms special song, this is the most important part of your night. Some weddings have many special songs which include the first dance, a dance with the parents and a dance with the bridal party. Getting these songs right in these moments is crucial so make sure to be well prepared for these times. A good rule of thumb is to keep the music fast and lively while mixing in a slow song for people to have a rest in between. Most weddings will start with older songs giving the older generation a chance to dance and throughout the night the music can become more modern to please the younger crowd. Reading a crowd for what songs to play is an art form that can sometimes take many years to grasp. Often times a Dj will receive requests for songs to be played and if appropriate make sure that they get played. Nothing makes people more upset then not playing a certain song that was requested. Be prepared to have a late night of partying, drinking and good times. Before the drop comes the build up. If you want to make your drop hit hard you gotta raise the stakes before. It’s just like gravity. This article is all about making compelling build ups that engage and emotionally charge your performance and make it memorable. What goes up must come down, and if you want to do the best build ups you have to learn the balance of tension and release. As a DJ you have a bunch of software and hardware tools and effects available at your disposal. Beat rolls are one of the simplest ways to create an easy tension in a live performance. These effects are called Beat Masher in Traktor and a Loop Rolling in Serato. This is about as easy as it gets but it’s foundational and done right still sounds amazing. You need to practice and build an intuitive feel to properly manage when to build the tension with the beat roll in a song. Beat roll allows you to create tension immediately with the push of a button just before a major point in a song. Doing so will stop the song from progressing while a beat loops until release. At which point the song will play like nothing happened. Drop, drop, drop, the beat. 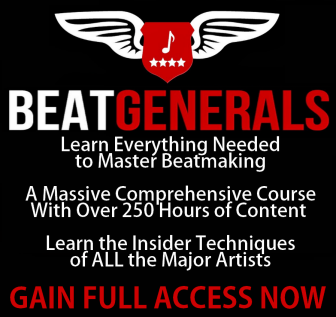 This tension is created from stopping the track to focus on a specific beat rhythm. One trick with the beat roll is to transition through the values through larger to incrementally smaller loops. That means start with a big beat value on the down beat, then engage the next smallest value on a down beat in the created loop, then smaller until a hyper fast beat is looped. For example you start beat rolling an 8 count, then on beat you beat roll it to 4 beats, 2, then one. The tension builds as the song hits a fever pitch. The release jumping back to the song will drive your audience crazy with such an amazing build up. These guys are a little different from beat rolls in they don’t pause the track to focus on a segment. Instead they work to create a new sound by making the existing track fuller and more hectic. Again this adds to the whole charging the audience before the release but it’s done in a different way. Practice will once again rain king as you learn when this works and when it sounds terrible. So for this one you’re going to need a controller or mixer with a delay function. All you need to do is add in a small delay at around 1 beat, then over the course of a few beats (8 to 16) ramp it up to it’s max value to spike the energy of the song. Then quickly drop the delay and release the tension. If you really want to get balls to the wall crazy and your gear allows you to set the delay to post fader or master. What you do is set your delay to your channel post fader. Then bounce this channel in and out using your cross fader. Basically you send parts of the song into the delayed channel through the cross fader by flicking it in and out making a ridiculously cool effect that builds some massive tension. This works really well with the echo effects, but reverb and a few others also work real well. Experiment and definitely try new things to see how you can craft some amazing build ups through manipulating the energy of a song. Don’t just stick to the higher energy side of the spectrum, if you figure out ways to drop the energy you can make even deeper drops after the cliff as well. Also as with anything don’t overdo it. Sometimes subtlety is king. Practice will raise your intuition on what the perfect amount is and smooth out your show. Artists often times get disoriented when monitoring their stage performance in live shows through the speaker systems. Even the most seasoned live gig veterans can get confused by a venue with weird stage acoustics. IEMs or In-ear monitors are a great way to cut through this confusion with consistency across the performance area. With the drop in cost and raise in features any serious artist should take a serious look at making the switch. One of the major issues with over ear headphones is that the headphones frequently have to compete with the acoustics of the room. This room noise getting in the way of clearly hearing your sound is something you never have to deal with with in-ear headphones as they naturally noise cancel and do so without needing expensive feedback circuitry. With in-ears you intimately get a crystal clear rendition of your performance’s complete sound. You don’t get drowned out and lost anymore. You don’t have to worry about how you sound because you’ll know. Taking the weight of uncertainty away is one of the greatest strengths of in-ear monitoring. It’s your music, your fans and you. With IEMs you’ll find that your performance will gain some massive consistency. This is because you hear the same thing regardless of your postion on the stage. Without IEMs if you go left in one show and right in another you’ll micro-adjust and it will be more difficult to gain the experience to lock down a consistent performance. The practice will take longer to lock in your sound. Same thing for different venues and their sound systems, if one venue runs low, and the next venue runs hot that might make for an uncomfortable audience. One of the greatest strengths of in-ear monitoring is that it’s really simple and doesn’t take much gear. For a setup you have a monitor mixer, cables, and your in-ear headphones. It’s a quick setup and it’s very liberating compared to more complex alternatives. Simple means a quick setup and tear down, which means more time to tune to the perfect sound. It all depends on what kind of setup you’re opting for. IEMs don’t have to be expensive. You don’t need to get the wireless battery packs or custom made in-ears to reap all the benefits. Wired universal fit in-ear headphones are great for getting started and gaining all these advantages for your live performance. Remember to stay within your means, there are a lot of really good universals out there. But IEMs are extremely recommended over wedges. However if you have the means, a more liberating method is to get a wireless two piece system with a sound system linked transmitter and a wireless receiver carried on your person. With this you’ll be completely free to roam the stage, all while keeping track of your sound and being able to give your crowd your best show. If you want to go all out, you can get custom fitted moulded ear pieces for maximum secure fitting. You won’t have to worry about them falling out and the sound quality will be the best by far as universal IEM headsets will let some ambient noise in where fitted IEMs won’t.